Exclusive 5 bedroom stone villa with swimming pool situated in Cavtat near Dubrovnik providing maximum comfort on your holiday. Villa is simply a stunning property offering all the best what villa can offer.This villa is recently renovated in a traditional Dubrovnik style to perfectly blend-in with the classical Mediterranean surroundings. 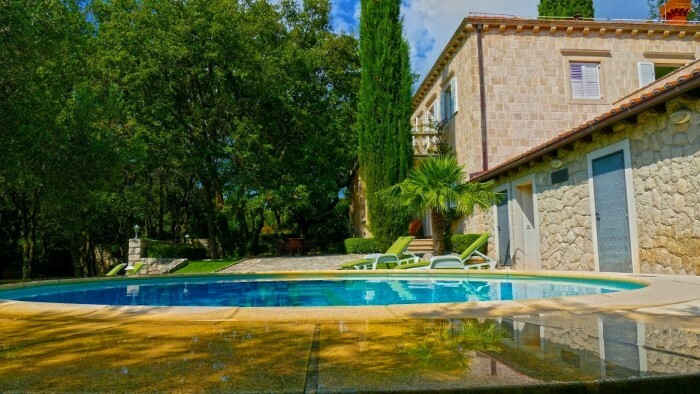 Unique 6 bedroom holiday home with heated swimming pool situated in Lopud Island near Dubrovnik providing maximum comfort on your holiday. Villa is simply a stunning property offering all the best what villa can offer.This villa is recently renovated in a traditional Dubrovnik style to perfectly blend-in with the classical Mediterranean surroundings. Beautiful 3 bedroom villa located in Molunat with private swimming pool and extraordinary sea views. Perfect for romantic and family holidays with kids and and it`s ideal choise for family who seeking a relaxing holiday in Dubrovnik Riviera. Charming 5 bedroom stone villa with private swimming pool,bbq,eleganty furnished in Konavle region.The villa’s position ensures spectacular view on surrounding countryside and it`s ideal choice for a scenic and relaxing summer holiday. Our luxurious treat 4 bedroom Villa Theresa located in Konavle, is an irresistible blend of old and new, warm and cold, romantic and cozy. With a contemporary interior and traditional exterior, including a private swimming pool,Theresa is just the perfect place for a wonderful holiday experience.